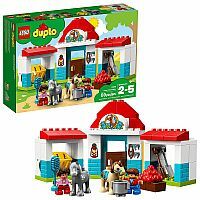 Play out real-life scenarios in LEGO DUPLO Town: a recognizable world with modern DUPLO figures. Preschoolers will love learning to care for the ponies at the 10868 Farm Pony Stable, using the brush to groom them and then leading them to the tipping hay feeder. The stables are easy to build and rebuild in different ways, providing endless role-play opportunities for little pony lovers in this great horse toy for toddlers. Includes 2 DUPLO figures plus 2 pony figures.